As the family was planning our trip to Florida, Bobbie (the mother-in-law) and I decided to make a quilt for Bob and Patty (her nephew and niece and the Polack's cousins), who live near Orlando and are always willing to host us. I choose a new technique to try and wanted the colors to reflect the decor of Bob and Patty's family room. 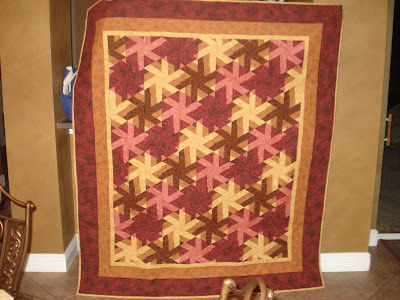 Bobbie and I pieced it, I did the quilting, and Bobbie did the binding.